The U.S midterm elections this November brought many issues to light, one particularly prominent one being voter suppression. Whether legislative- some states have recently introduced laws that impose conditions on voting- or physical, polls have been moved to inaccessible locations, closed early, and run out of ballots, there were allegations of intentional voter suppression across the country. 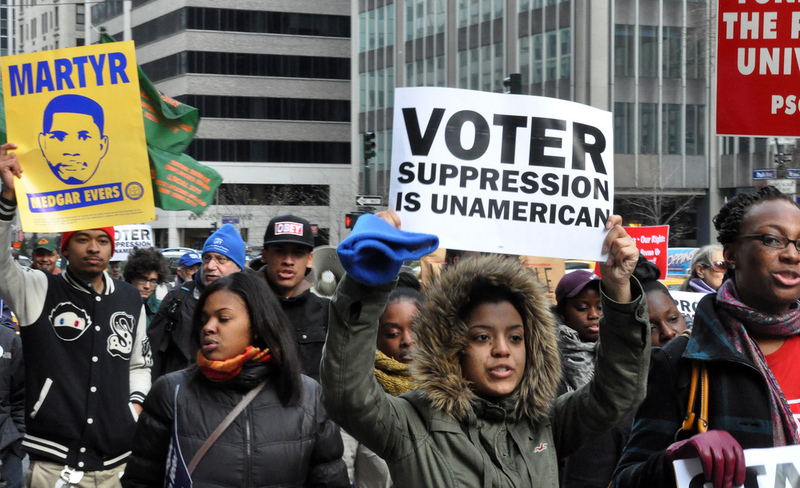 The Supreme Court’s 2013 decision to strike down the core of the Voting Rights Act of 1965, a hard-earned achievement for the Civil Rights movement, has enabled states to complicate the voting process and render it less accessible for minority voters in particular. The Voting Rights Act was the long-awaited response to calls from civil rights organizations and leaders such as Martin Luther King Jr to prohibit racial discrimination in American elections. Equal voting rights for black men had been legally established in the US Constitution’s 15th Amendment, passed in 1870, which stated that the right to vote “shall not be denied by the United States or by any State on account of race, color, or previous condition of servitude”. Nevertheless, states imposed their own obstacles, including literacy tests and poll taxes. Literacy tests would often involve a 10-minute written test requiring in-depth knowledge of how the American electoral system worked. In other states, a white clerk would choose a passage of the Constitution for Black applicants to explain, essentially placing their ability to register in the hands of a white clerk. In order to be successfully registered, voters would also have to pay a “poll tax”, sometimes due up to two years in advance. Though the fee wasn’t exorbitant, it was still an additional economic burden on African American families, who remained one of the most economically disadvantaged groups, particularly in the South. This test was used in Sumter County, Georgia, in 1963. To prevent these measures from disenfranchising white voters, many states introduced a “Grandfather Clause” in 1898, wherein voters were automatically eligible to vote if their grandfathers had been — an obvious exclusion of black voters, many of whose grandfathers lacked rights of any kind. If these measures were unsuccessful, black voters were often threatened with being fired, or evicted and were routinely harassed by voting clerks and mobs, with more extreme cases including being arrested on false charges and being lynched. Finally, in early 1965, during a peaceful civil rights march from Selma, Alabama, to Montgomery, the state capital, over 500 marchers were attacked by armed state troopers and mounted police, in an event thereafter known as “Bloody Sunday”. Later that month, Lyndon B. Johnson introduced the Voting Rights Act of 1965, and Congress passed the bill in August of that year. How Successful was the Voting Rights Act? The Act codified the 15th Amendment and outlawed “barriers to political participation by racial and ethnic minorities”, such as literacy tests and poll taxes, and most importantly, required counties with a persistent history of voter discrimination to seek federal approval for any changes in their election laws before being allowed to make them. The Act was, as Dr. Martin Luther King Jr. called it, a “great step forward”. However, challenges persisted in some areas- “state and local enforcement of the law was weak […] mainly in the South and in areas where the proportion of blacks in the population was high and their vote threatened the political status quo”. Still, by mid-1966, more than half a million black people in the South had registered to vote, and by 1968, nearly 400 black people had been elected to office. Overall, the Voting Rights Act proved to be a historic step towards the participation of minorities in the American democracy. Arguably one of the most important components of the Voting Rights Act was Section 5, which mandated that districts with a history of discriminatory voting practices –defined in Section 4(b) as those which had both a literacy test and a below 50% turnout in the 1964 presidential election– must seek federal approval before enacting new voter laws. This condition was instituted in order to verify that new voter laws not only lacked discriminatory intent, but also wouldn’t have discriminatory effects if put in place. In April 2010, Shelby County, Alabama filed a suit arguing that Section 5 was unconstitutional as it contradicts Article Four of the Constitution, which guarantees the right of self-government for every state. The Supreme Court ultimately struck down Section 5 on the grounds that protection against racial voter discrimination was simply not necessary anymore. Chief Justice John Roberts’ reasoning refers to the fact that obstacles such as literacy tests no longer exist, and further, that “racial disparity in those numbers was compelling evidence […] there is no longer such a disparity”. Since that decision, 24 states have implemented restrictions that have complicated voting, and in many cases, the Supreme Court has allowed them. One such example is Texas, which has doubled down on voter suppression measures, with both Voter ID laws and “remarkably gerrymandered” district maps. According to the ID law, voters must show government-issued photo IDs in order to vote. A lower court initially blocked both Texas’s voter ID law and its new maps after it concluded that it would have a discriminatory impact, and in addition, that “there had been a pattern of conduct unexplainable on grounds other than the race factor”. However, a federal appeals court overturned the ruling, allowing the state to implement both measures. According to a study by the Washington Post, strict ID laws result in the turnout gap between conservative and liberal voters rising from 7.7 to 20.4 points, and the turnout gap between white and black voters rising from 2.5 to 11.6 points. The study concludes that “strict voter ID laws tilt the primary electorate dramatically” towards the right. Voting Rights has been an issue in Georgia for a long time before the midterm elections. This year’s gubernatorial race saw Democrat Stacey Abrams, a longtime voting rights activist, run against Georgia’s Republican secretary of state, Brian Kemp. Abrams has been working for years to register minority voters. In 2014, her organization, the New Georgia Project, set out on a large-scale registration program geared towards citizens of colour, of which around 69,000 were registered. Kemp, on the other hand, is currently the subject of two federal lawsuits filed by civil rights groups on the grounds that his office is rejecting “a high number of absentee ballots from African-American and Asian-American voters”. As Georgia’s Secretary of State, Kemp is in charge of voting systems in the governor’s race in which he is taking part — an obvious conflict of interest. He has used his position to unashamedly implement several obstacles to voting, one of which is the “exact match system” . Known as “disenfranchisement by typo”, the exact-match system holds that a person’s name on their voter registration form must exactly match the name on their ID. This policy was initially blocked by the federal government under the Voting Rights Act, finding that it was more likely to flag minority voters because their names are typically less familiar to election workers who enter the data, producing a bias towards “traditional, anglicized names”. However, because Shelby County vs. Holder removed the federal government’s power to review voting laws, the exact match system could legally be used. Under this system, 53,000 applications were flagged and put on hold, 70% of which belonged to black applicants. In addition, 214 polling places have been closed since, often in “rural, impoverished areas […] and areas with significantly black populations”, further hinting at Kemp’s bias against these voters. North Dakota also imposed an ID law that was upheld by the Supreme Court, despite being identified as an obstacle to Native American voters. Under this law, your ID must have a current residential street address on it. However, many Native Americans live on reservations, which only have a P.O Box number, as the reservations are often in areas too remote for mail delivery. Since the P.O Box alone does not qualify as a residential street address, around 5,000 Native American voters have been disenfranchised. Many Republican leaders claim that strict voting laws are necessary to rein in voter fraud. Earlier this month, Trump himself claimed that Democrats were carrying out voter fraud in order to tilt the US Senate election in Florida in favour Bill Nelson, the Democratic incumbent. The actual rate of impersonation fraud has been established to be around 0.0003% at most. It is likely that lawsuits regarding voter rights will continue to reach the Supreme Court. Shelby County vs. Holder represented a definite ideological shift towards conservatism that the appointment of Brett Kavanaugh is almost certain to exacerbate, given his 2012 ruling upholding a South Carolina voter ID law likely to disenfranchise over 80,000 minority voters. Kavanaugh’s decision asserted that South Carolina had a “legitimate interest in enacting stringent regulations to combat voter fraud”- even though the state had submitted no evidence of actual in-person voter fraud of the type the law was supposedly meant to target. Neither the Supreme Court nor the Administration seem willing to prioritize the issue of voter rights. via Wikimedia Commons. However, there have also been a few positive developments. States such as Michigan and Nevada have made it easier to vote, and Florida just voted to overturn a segregation-era law banning ex-felons from voting, giving the vote back to over 1.5 million people, many of whom are black men. Slowly eroding the voting power of minorities across the country is just another step, along with trying to repeal DACA, revoking birthright citizenship, and detaining migrant children from South and Central America, towards creating a hostile environment for people of colour. With a more conservative government and administration, it is more important than ever that voters pay attention to their rights and elect those who will protect them. Elina Qureshi is a U1 student currently pursuing a double major in Economics & International Development. She focuses on Middle East politics, Canadian foreign policy, and international institutions.